You really don't have to live in Florida to get a taste of the tropics. If you have ever been on a tropical vacation then this will be a treat for you. Spiced rum and toasted coconut over grilled fruits, a delicious mind vacation get away. This is just one of those recipes that makes you sing Spring and they will carry you through the entire summer with a smile! Enjoy, relax and watch the video, you will love the rum sauce on these Tropical Grilled Fruit Kabobs. The Easiest Grilling Dessert Ever! When you decide to have a barbecue party in the summer, nothing beats grilled fruit kabobs! They are fast, easy to prepare and this Tropical Grilled Fruit Kabobs with Rum Sauce will take you to a tropical island in flavors! The rum sauce is made separately so for the kids, of course, you could use just rum flavoring and no alcohol or just pass it on to adults. You can use cubed pound cake, soft miniature candy bars, fruits of all kinds and marshmallows to keep the kids and young at heart happy too! When it comes to a Florida barbecue, it just wouldn't be complete without these delicious Tropical Grilled Fruit Kabobs with Rum Sauce! I love to mix up the fruits and use banana, pineapple, cherries, and peaches. We are lucky enough to get the great pleasure of grilling out and having a backyard barbecue all year long with our amazing weather. When I have a grilling party these are always gone in a New York minute! Fire up that grill and get that delicious Tropical feeling no matter where you live. 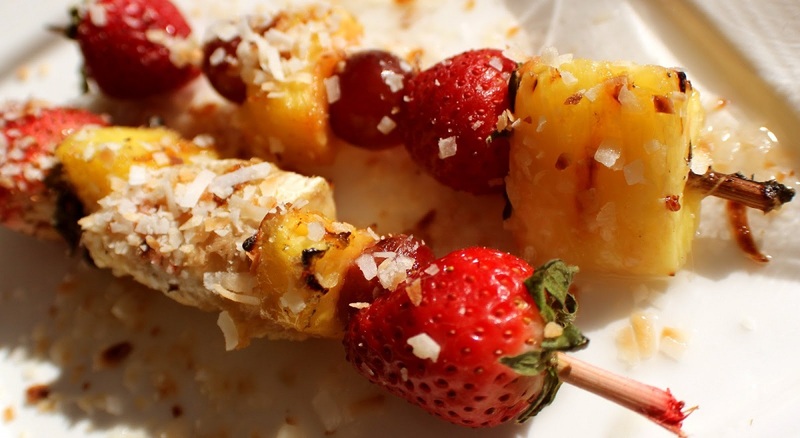 Everyone will enjoy these Tropical Grilled Fruit Kabobs with Rum Sauce!! The heat index can get higher than 100, so on those days when we grill outside, we cook lighter meals and desserts. This is one that isn't going to leave you with that heavy feeling and you will still have room for dessert with these Tropical Grilled Fruit Kabobs with Rum Sauce. The best part about them is they are quick and easy to prepare for company and family that drop by. If you just need a quick dessert and don't want to turn the oven on, this is my go-to recipe. Grilled fruits are fast so you won't be standing over that grill too long. Get that grill fired up and try these Tropical Grilled Fruit Kabobs with Rum Sauce tonight for your barbecue party you will love them too! Try Some of these other Grilling Recipes to go along with your Dessert! 1 pound of cubed assorted fruit, half strawberries, large berries, pineapple, pear, mango, semi-cooked apple slices, grapes, kiwi, peaches my favorite is to use peaches when in season), plums, banana. Optional: marshmallows, chocolate soft candy-like milky way or mars, pound cake cut in cubes (other fruits to use melons, can also be used). Heat your grill and spray the grates lightly will cooking spray. Meanwhile, make the rum sauce: Combine the orange juice, rum, brown sugar, cardamom, orange and lemon zest and clove in a small saucepan. Bring to a boil over high heat, stirring to dissolve the sugar. Reduce the heat to medium and boil gently until the liquid is reduced by half, about 10 minutes. Remove from the heat and let the sauce steep for 10 minutes. Using a slotted spoon, lift out the whole spices and citrus zests, reserving 2 strips of the orange zest and discarding the rest. Chop the orange zest and stir into the warm sauce. Thread skewers with fruits (whatever you prefer: pineapple cube, banana piece, kiwi, grapes, peach, mango, banana piece and start over if needed. If using marshmallows and chocolate place on foil sprayed lightly with oil spray. Using tongs, place the kabobs directly on grill grates, turning them as needed, until lightly marked on each side, 3 to 4 minutes total. Place on serving a dish. Spoon the warm sauce over the kabobs for each serving. Serve warm garnish with coconut. This is lovely. I had something like this in the caribbean. It is a very nice dessert. Poking things with spears, fire and alcohol this sounds like a fun recipe to me. I am definitely making this one. I love grilled fruit and your sauce takes this kebob right over the top. What a perfect side dish on a summers day, luncheon or BBQ. 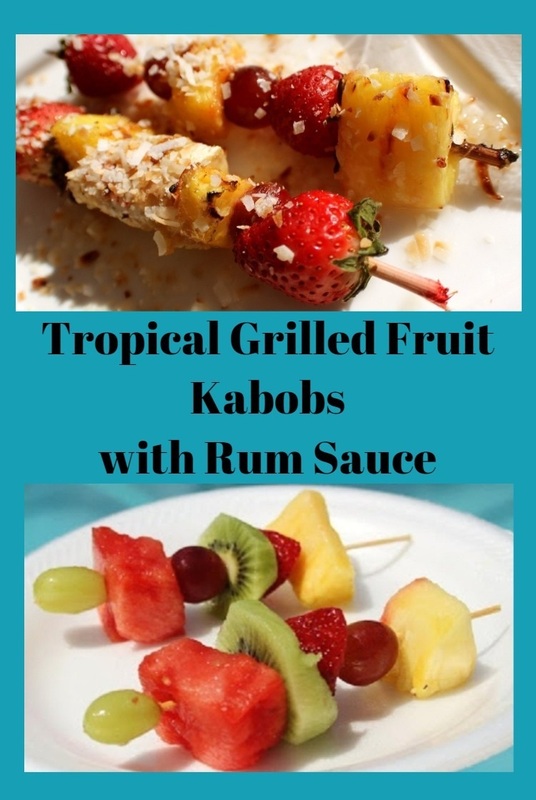 I love grilled fruits, and your grilled kabob with the tropical rum sauce is amazing, and sooooo yummy with the coconut, and the rum! These do look fabulous! Very creative way to serve up some juicy fruit. Also, the rum sauce would be a requirement for this one-yum! Enjoy the day. This looks very interesting and something I'd like to try, but I'm confused with the recipe... You listed the ingredients for the rum sauce but in the directions, you also listed "cardamom" for the rum sauce! How much "cardamom" is used in the sauce?! This looks very interesting and something I'd like to try but I am confused about the recipe... You've listed all of the ingredients, but in the directions, you also listed "cardamom" for the rum sauce! How much "cardamom" is needed for the sauce? !